Pamela Keogh always wanted to be a writer and grew up with very stylish parents. I was excited when she told me that while she was an editor at US Weekly, she was the one who introduced fashion to its pages and covered parties for the magazine. How cool is that? She also had a stint as a producer on Extra. As an established freelance journalist, the next obvious decision was to write a book. Pamela had a friend at The New York Times who referred her to her agent, and of course they signed her since she’s a great writer. But at the time she didn’t know what to write a book about. The name AudreyStyle came to her and she ended up writing a biography that included some never-seen-before glossy photos of Audrey Hepburn and information that had not been previously published. After the success of that book, she went on to write JackieStyle and Elvis Presley: The Man. The Life. The Legend. I had a lovely chat yesterday with Pamela, who by the way lives on the Upper East Side and is friends with the owner of the townhouse that was used for the exterior shots of Holly Golightly’s apartment in Breakfast at Tiffany’s. Yes, I’m jealous ‘cause I so want to see the inside of that house. I had to know what Pamela had for breakfast on the day that What Would Audrey Do? came out, and she didn’t disappoint: a brioche, oatmeal and cappuccino at Balthazar. The management even sent her a couple of glasses of champagne to celebrate. Unfortunately, Pamela was unable to meet Audrey before she passed away, but I was curious about what question she’d ask Audrey in heaven. 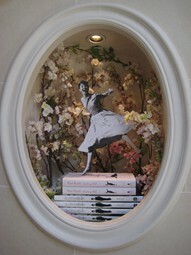 “Did you like it [What Would Audrey Do? ]”, Pamela answered. She would have also liked to discuss politics with her since we’re in such an interesting time. I asked Pamela how she was able to interview so many people who were close to Audrey and garnered such amazing insider information. It was largely in part due to the generosity of Audrey’s companion who survives her, Robert Wolders, who opened his rolodex to her. While the book covers Audrey and all her family, I was surprised that there wasn’t much information about Audrey’s youngest son, Luca. Pamela explained that he is a very private person and currently lives in Paris. The book took Pamela three to four months to write and research. 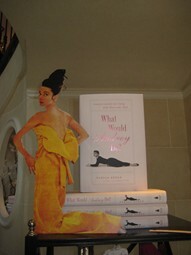 I was very curious about which Hollywood celebrity she thinks would benefit the most from reading What Would Audrey Do? After a long pause she said, “Every single woman on “The Hills.” I couldn’t agree more. The book has a lot of good advice on how to emulate Audrey’s classy approach to being famous. All aspiring actresses (and famous ones) could really benefit from reading her tips. As Audrey said once when asked if she had ever had plastic surgery, “I’ve earned every one of my wrinkles”. BAT: What are you currently reading? PK: A New Earth by Eckhart Tolle. BAT: What was the last movie you saw? I’m very excited to do a giveaway, because I know you all are going to love this book. Please e-mail me at TiffanyStone@gmail.com with what question you would ask Audrey Hepburn if you could. Use AH Giveaway in the subject line. I will be picking a winner and e-mailing them back by 6:00 pm PST Thursday.